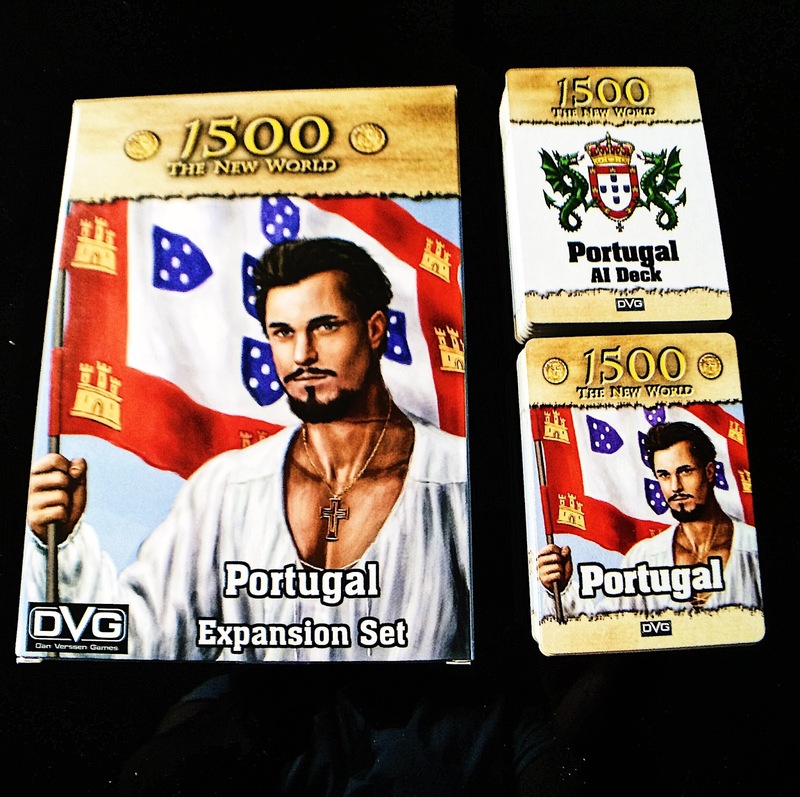 1500: The New World by DVG is a 2-6 player competitive board game that lasts 6 rounds. On your turn, you will compete against the other players in building colonies and earning victory points. This is done by playing cards that allow you to place tokens on the board in any area, or manipulate any other player's tokens that are already on the board. After your turn, you will tally the score you earned on the turn, then allow the next player to go. Once each player has taken their turn, you will, using the turn indicator, mark the next turn until all 6 rounds have been completed. High score at that time wins the game! Setup for the game is very simple. Open the map and place it on the playing area. 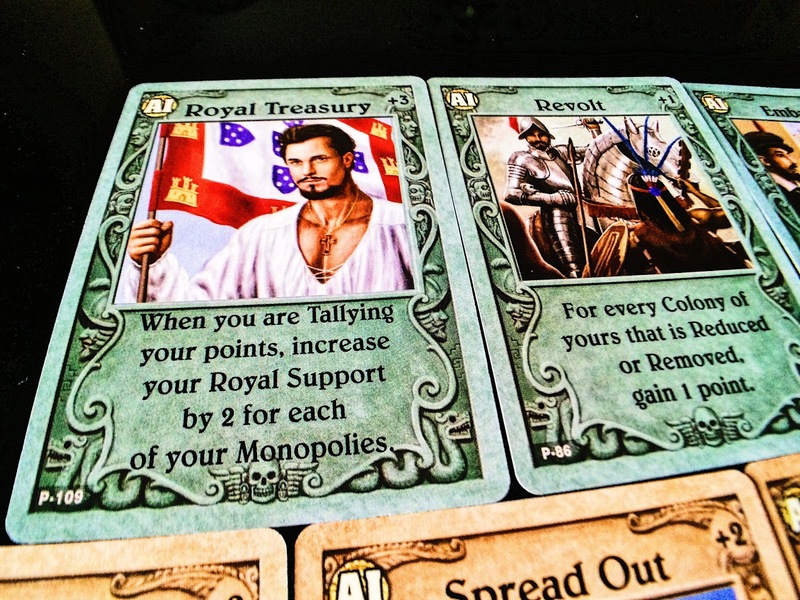 The cards that come with the game are then shuffled and placed on the board in the area that is marked as Draw Deck Area. Each player will select the tokens in the color they want, along with their markers. 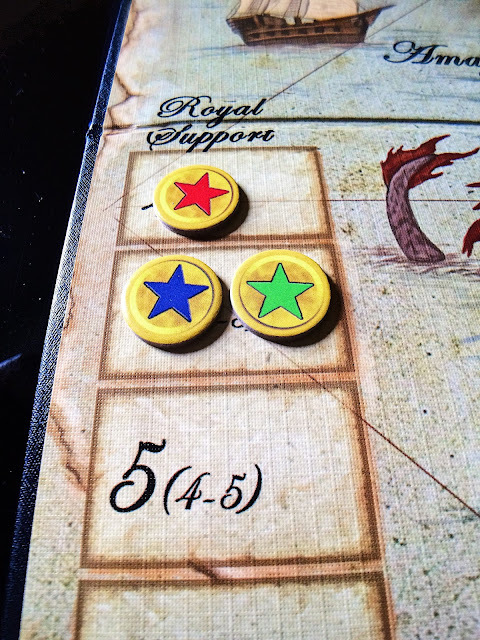 After choosing the first player, that player will place one of their markers along the lower left side of the board on the track called "Royal Support." Inside each rectangle, you’ll note a large number followed by smaller numbers in parentheses. The large number represents both the number of cards that player draws on each turn and the maximum number of cards that can be held, while the small number represents the player number. After the first player places their marker, they will draw the 4 cards that are indicated in the first box. The next players (players 2 and 3) place their markers in the next box, which also shows a 4 card maximum, and this continues until each player has placed the marker and drawn their cards. 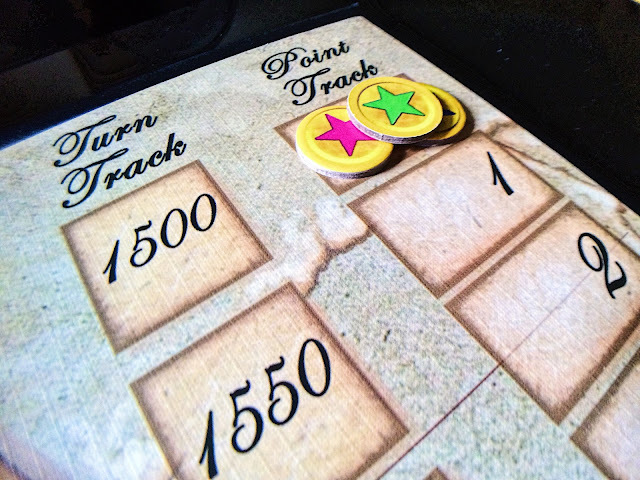 Next you’ll place a marker in the track called "Point Track," which is in the upper right corner of the game board. Each player starts with a count of 0 points. Finally, on the track next to the Point Track is one called the "Turn Track." You’ll place the token that looks like an hour glass in the "1500" box. Setup is now complete. Now let’s look at the rules! The cards themselves can be used in a number of different ways, most on your turn, but there are cards that allow you to stop an action that your opponent is doing (note: this does not end their turn, just influences the particular action they are trying to enact with a card). On your turn, you can use a card in any of the following manners: 1) Its printed text. Each card allows for an action to be done, and is clearly printed on it. 2) Discard the card to place any colony on an unoccupied space. 3) Discard the card to manipulate an established colony. This is called "Reducing" (more below on this). 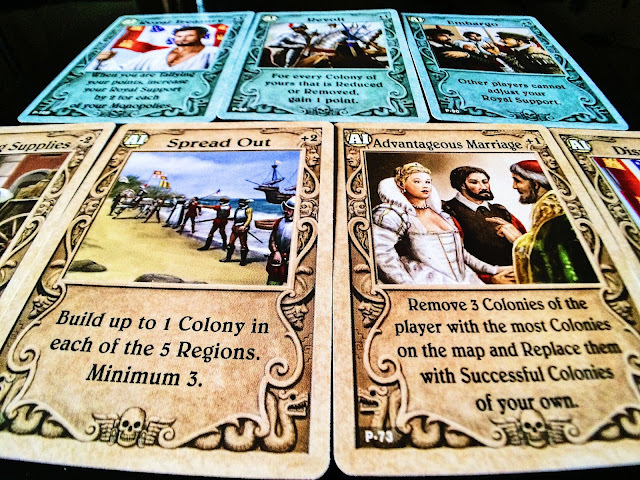 4) Discard the card to Repair an established colony (the opposite of Reducing a colony). And 5) Modify a Royal Support ranking. Each card, in the upper right corner, has a value (either positive or negative). If it is a positive value, it will increase your standing. A negative value will be played on your opponent, reducing their standing. Speaking of cards, let’s talk about maximum hand size. The maximum number of cards you can have in your hand at any time is the number that your marker on the Point Track is on. If at any time after drawing, you go over that number, discard back down. You do not need to play all your cards in your hand during your turn, but remember, on your turn you will be drawing the number of cards your token on the point track is on, and will need to discard. We’ll focus on the colonies themselves now. 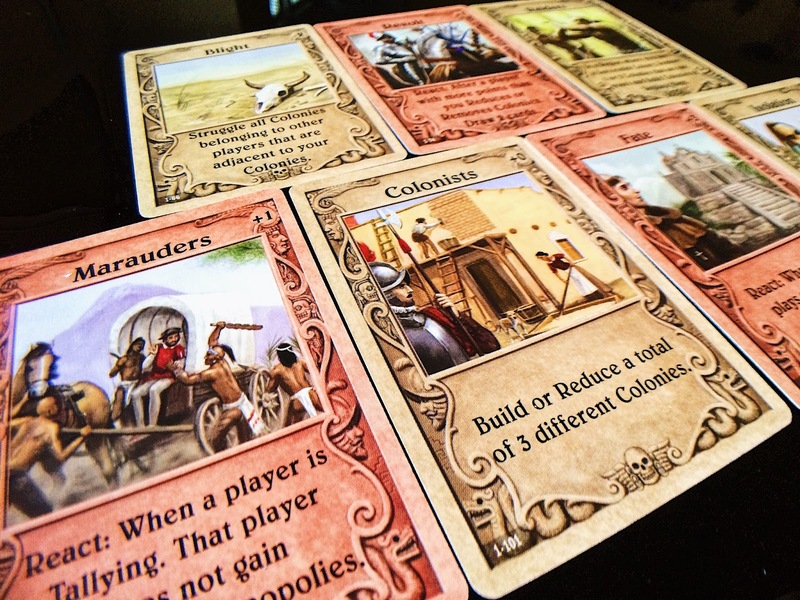 As mentioned, cards have abilities on them which allow you to place or modify existing colonies on the playing board. Each colony token has two sides to it. 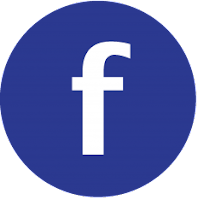 When placed, it is considered a healthy (or "Successful") colony. When discarding a card to "Reduce" the colony, you flip the token to show that it is now "Suffering." If you Reduce that colony once more, it is then removed from the player board, opening up that area to colonization. Let me take the time to also say that there are 5 expansions already available with the game, where you will be playing the role of a different country (Portugal, Netherlands, England, Spain, and France). Additionally, each nation adds an AI deck, which now makes the game solo friendly! This also add the ability of multiple country AI’s being played against the players. 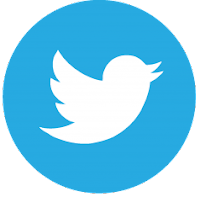 Let me talk briefly on the expansions. Each card shows on the back which country it is from, along with wording to let you know if it’s the AI Deck or player deck. There is also a new phase, that being called the "Start of Round," of which the AI has cards built around them. These cards are clearly marked on the back with gold circle on the lower left corner with the word "Start" in it, and are played at the start of each round (if drawn by the AI) after all players draw their cards. When playing with an AI, the AI plays last in the round. Game play for them is similar to a non-AI player, meaning they’ll draw their cards at the same time, based on the same criteria. Their cards are placed face-down, and turned face up on their turn. 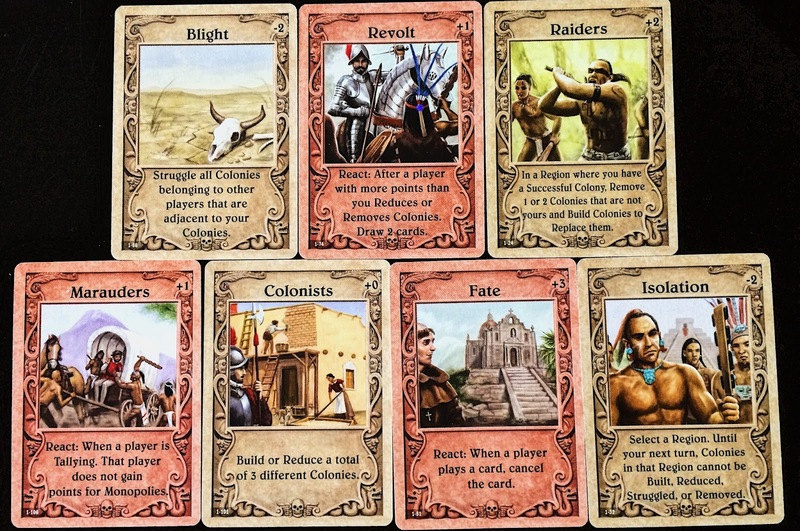 AI will score negative points at the beginning of their turn based on their struggling colonies, then start their card play, targeting the player with the highest points. The board itself is broken out in 15 different areas, with 5 different regions on the board. 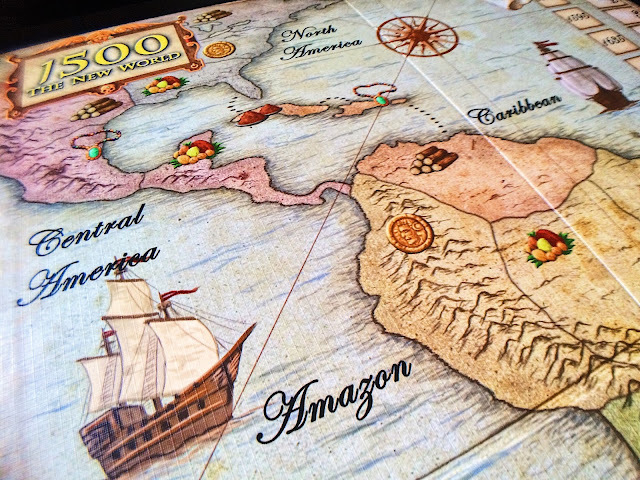 Throughout the board, there are 3 icons for 5 different goods (Lumber, Gold, Fruit, Jewels, and Spice). These icons are all within different areas in each region. Finally, let’s talk about the End of Turn, which is triggered when the active player finishes playing cards (remember, you do not need to play all the cards in your hand). At this point, scoring for your turn occurs. You’ll start by gaining 1 point for each colony that is successful, then looking to see if you have control of any region. For each region that you control all the areas within it, gain another 2 points. The same holds for any monopolies you have on the goods (3 for each good), where you’ll gain 2 points. You can also gain negative points for any colony that is suffering, as each one counts as a -1 value. Update the point tracker, and it’s the next player's turn. Once all players take their turn, move the turn marker up one, and everyone draws back up. We’ll take the Mechanics first. This game is a very simple game to learn and play. On your turn, you will be playing the cards in your hand and manipulating parts of the game board, trying to gain control of different areas and/or resources. That’s right, it’s an area control game! That’s it! Really. Very straight-forward and easy to learn and play! Mechanically, making this an area control game fits in perfectly with the style of the game. 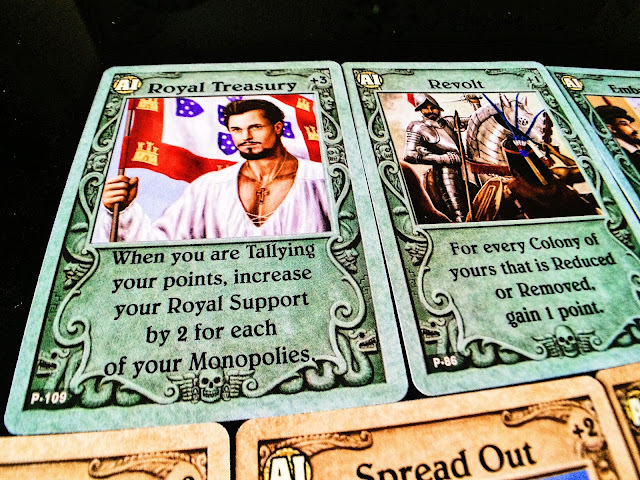 You will be vying for control and scoring points at the end of your turn, trying to outmaneuver your opponent. With artwork on the cards reflecting that era, the design of the board looking to match what it would look like if drawn back then, and the colors matching what would have been used, this comes together nicely. Theme, on the other hand, really doesn’t add much to the game. There is nothing (other than some artwork on cards, and the map of the Americas) that immerses you in the discovery of the new world. This is not your typical Dan Verssen game where the theme fits and makes the game. 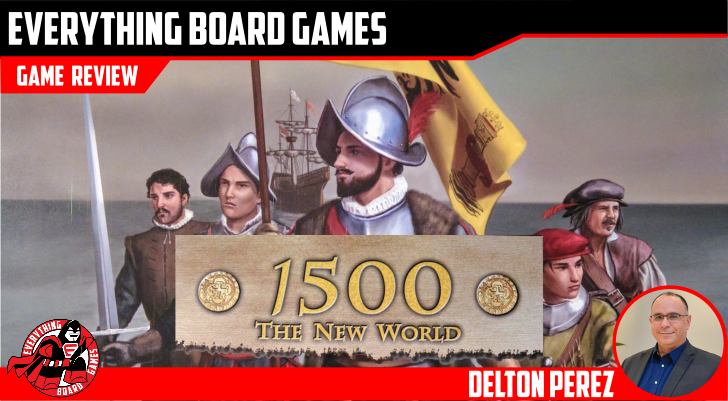 Gameplay for 1500: The New World is quite simple and streamlined, in which you play all cards in your hand, count your points, then draw back up. With some player interaction going on, the game does not take a lot to learn, but does make you plan your moves and placements of settlements carefully. 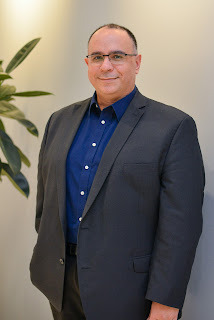 While some analysis paralysis may happen as you try and plan the next move, with all players drawing from the same deck of cards--and the board changing drastically on each player's turn--the AP will be short. The artwork, as mentioned above, fits in with the theme of the game. With the cards having different images on them matching the name of the card, it goes well together. A lot of tab, grey, beige, and light greens are used on both cards and game board, reminiscent of that era. 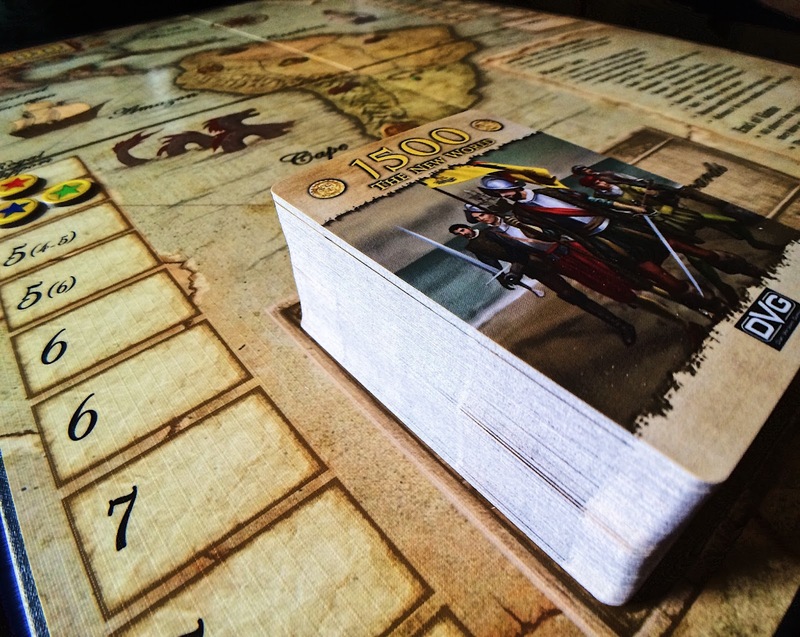 Looking at the components, the tokens and markers are all standard high-quality DVG pieces of cardboard, with the thickness and design expected. 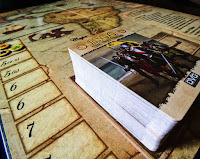 Card stock is of a standard size, and a sturdy stock, allowing for lots of card shuffling. There is a slight discoloration noted on some of the cards (each card has between 3-6 copies, and you’ll notice that occasionally 1 of them will have a darker coloration to it). Game board is a standard stock, and folds down into 4 sections, each about the size of a sheet of paper (8.5”x 11.0” or 215.9 x 279.4 mm) connected in the middle. However, after being out of the box, some warping can occur in the board itself (image below), and while it doesn’t impact gameplay, it is noticeable when folded. 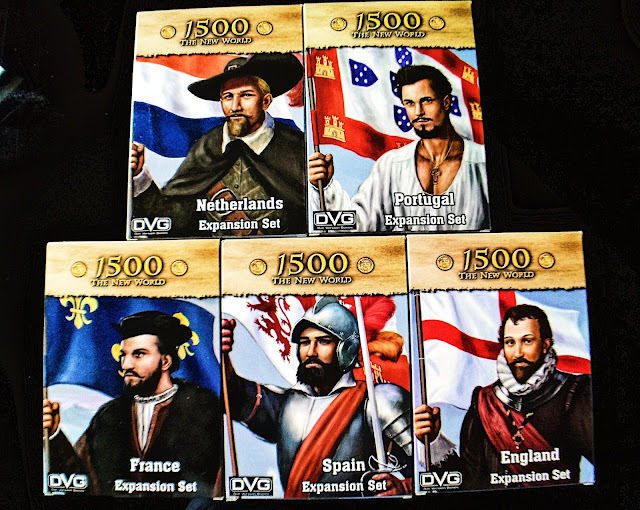 1500: The New World is a great 1-6 player game that, with the inclusion of expansions, allows for an AI that really ramps up the difficulty in the game. While the rules are fairly simple to learn, game time takes around 20-30 minutes to play a full game through (if playing with 6 players, it takes around 40-50 minutes to go through a game). With the availability of 5 additional countries to play as, and cards specific to those countries, you’ll have lots of replay available in the box. Additionally, DVG has a cloth board available on their website, replacing the game board that comes with it. This makes it much easier to travel with and transport the game, as you’ll be down to some cards, and a cloth map. Did I mention the AI? Because believe me, it changes the game. The cards in the AI deck are there for one purpose – to stop you from getting points and take control of the board. Each country’s AI is different, and you have to play accordingly. And it adds solo play! There are a few things that really get to me when playing a game – quality of components and the rulebook. Unfortunately, both fall into this category with 1500: The New World. Let’s look at the rule book. 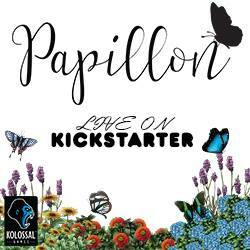 The book is 18 pages, with lots of artwork in them. 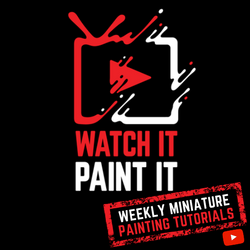 Unfortunately, the wording of some of the rules, and the manner in which the layout is around the artwork, takes away from the reading of it. 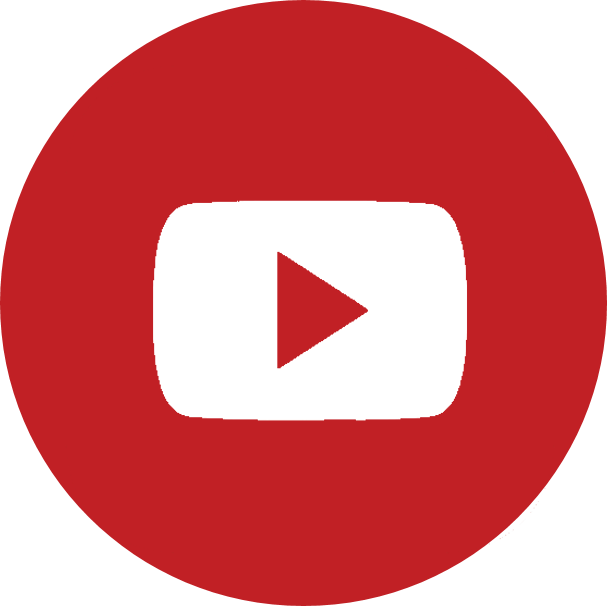 Examples abound throughout the book and are in red, making them easy to identify, but not everything needs to have examples on it. Add on 4 pages just showing the cards and their text (and more examples for the cards), along with 2 pages of a sample turn, and it just seems a bit too much. And then there’s the player board. After the second day of it being out of the box, we noticed the board was warped. Game play wasn’t impacted, but when you close the board, you’ll see that it doesn’t close back up neatly. While I love the idea of a cloth map, and I know this is a production issue, it would have been nice to have the cloth map in the box instead of the board, which could also allow for a smaller box. And yes, I know that people would then complain that it’s a non-standard box, especially when put next to other DVG games. With just over 10 games played of the base game, and 3+ of each expansion (some more than others), the game is a win! Game board and rule book aside, this is a light-mid weight area control game that flows smoothly. Being able to bring youth to the table in a game that they can understand quickly and win at is always a great thing, and 1500 allows for that. Change the game style with the addition of an expansion and its AI, and you’ll be challenged in an all-new way. With 5 AI's available to be added to a game in any manner, you won’t be bored or have a go-to strategy available to beat the game. Lots of great decision making will be needed. One of the light-weight games that Dan Verssen has brought us, 1500: The New World fits nicely in your library. Light to mid-weight games, area control games.